196 other birds have this item in their bag or wishlist! From boho bird the Heartsong Embroidered Jacket is one-of-a-kind. This unique, fully embellished jacket is perfect for adding some bohemian glam to your new season wardrobe. I went down a size but still found the fit too tent like, extremely wide A-Line. The cotton Velour felt stiff and not good quality. The cotton lining was very wrinkled. The only part I liked was the embroidery which was stunning. 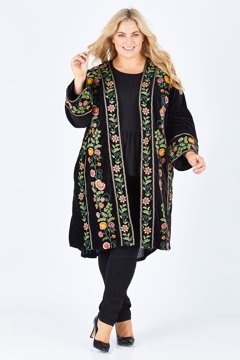 Beautiful embroidery on this lovely velvet coat. Quite roomy, so lots of room for bulky winter clothes underneath. This jacket is quite lovely. The embroidery is in lovely soft tones and against the black velvet looks quite stunning. I went a size down to 8, and the fit is perfect.